Next week, Advance CTE will recognize the winners of 2017’s Excellence in Action awards — an annual competition to elevate and celebrate high-quality programs of study. This year’s slate of competitors is stronger than ever, demonstrating how well-designed programs that integrate academic and technical instruction, span secondary and postsecondary education, and equip learners with relevant work-based learning experiences can prepare learners for academic achievement and career success. Examples of strong programs of study — and career pathways, more broadly — exist in every state. Yet all too often these career pathways are islands of excellence, setting the bar for quality, but requiring further state action to ensure all students can benefit from strong career pathways. While the approach to developing career pathways varies across the nation, state leaders can play a role in promoting quality by leveraging policy, programs and resources to ensure all career pathways meet minimum standards. Today Advance CTE released its newest report, Raising the Bar: State Strategies for Developing and Approving High-Quality Career Pathways. The report examines successes in Tennessee, New Jersey and Delaware to demonstrate how states can use the career pathways approval process to raise the level of quality. 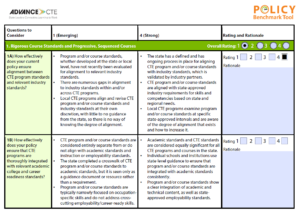 In Tennessee, the Department of Education in 2013 underwent an exhaustive course review initiative to align all courses and programs of study with labor market standards. Through the initiative, working groups of teachers, postsecondary faculty and employers reviewed and revised course standards. Ultimately, this effort led to the discontinuation of nearly one hundred courses. The New Jersey Department of Education in 2008 adopted a more hands-on process for enforcing the state’s program quality criteria, which were previously outlined in administrative code. Under the new system, local districts are required submit documentation of program structure for each program within a specific Career ClusterⓇ. And in 2015, Delaware implemented a new policy for reviewing and approving both local and state-model programs of study. The policy requires programs of both types to be developed with input from multiple stakeholders, including industry and postsecondary representatives. All states have processes in place to review and approve career pathways, but not all use them to promote and uphold quality standards. This report describes a few approaches states can take — such as defining quality criteria, using fiscal and accountability policy to incentivize adoption, and providing regional supports — to promote quality through the pathways approval process. 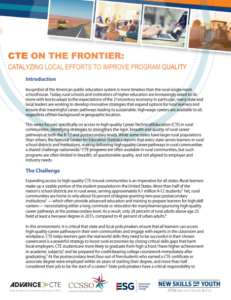 This report was developed through the New Skills for Youth initiative, a partnership of the Council of Chief State School Officers, Advance CTE and Education Strategy group, generously funded by JPMorgan Chase & Co.